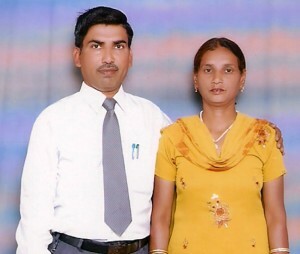 Biography: Immanuel began his ministry by starting Prayer Ministry in 1992, before he and Zeenat were married. The church, Suvarta Parivar Sangati, has grown to include eight cell groups, along with youth and children fellowships. They minister to so many children that they have expanded the children's ministry to three separate locations. The church has a nursery ministry which Zeenat teaches. In 2012 the church was renamed Bharat Bible Church. The vision of the ministry is to preach the gospel according to people's understanding, not our wisdom and knowledge, using the way Jesus ministered to people as their example. They are also seeking to develop a strategic system to share the salvation message to the Indian people. The church desires to make disciples in each village, city and town in the state of Haryana and in the north Indian states. There are 7,000 villages in Haryana. Immanuel and Zeenat have land on which they desire to build a church building, Bible school and hostel for boys of Christians and missionaries in India. Immanuel explained that most missionaries' children do not have the opportunity for a good education. They would like to start a residential academic opportunity for these children. Strengths: Immanuel and Zeenat are strong in preaching, teaching, singing and counseling. Immanuel tells us, "I have strength in my Lord Almighty God."